Hale Hamilton's standard NR ranges of adiabatically shock tested valves to EN ISO 7291 by CTE & BAM are in-line non-return valves feature a mitre seat insert to ensure a leak-tight shut-off with an efficient flow path. 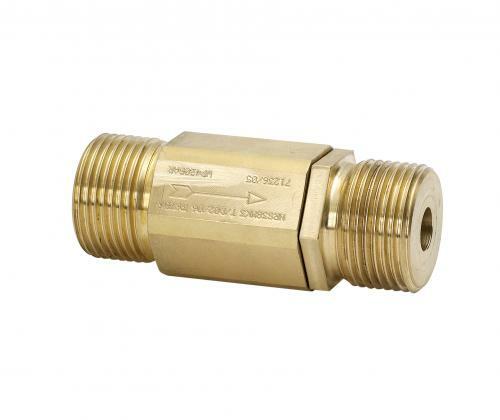 The valves are but lightly spring loaded to enable positive operation at any angle of installation. Series NR are a range of hard seated valves available in orifice diameters of 12 & 16mm, with port connections ranging from G5/8" to G1 1/4". Body materials of Brass, Aluminium Bronze, Stainles Steel, Monel & Inconel with a maximum working pressure of 400bar.